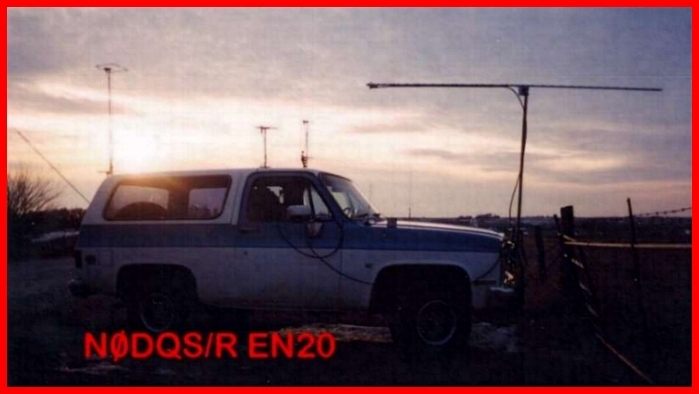 I started the 2001 ARRL January Sweepstakes from the home qth in EN22gd, stopped on the grid lines of 22 and 21 just to the south edge of Denison,Iowa and worked Mike,KMØT and WBØHHM, both in EN13 on several of the bands.From that area I also worked NØKQY in DM98, NØLL in EM09 on 2 and 432 and KBØQGT/R in EM09 on 2 and 432 and KCØHFL in EM17 as well as many others. From there i traveled south down HWY 59 thru EN21 into EN20.There I worked again NØLL in EM09, several stations in EN21 and EN10 and WØOHU,WØGHZ,KAØPQW some on 2 and 432 and N9DG in EN53 as well as others. Then I traveled east to EN31,30. From there I worked WBØULX in EN04 on 2 as well as KMØT on 6,2,432,222fm,1296 as well as others.From there I traveled north thru EN21 and in to EN32 and along the way had a nice late nite ragchew with KØJQA and worked him on 6,2 and 432. Activity was low at this point. Stayed overnite near Storm Lake,Ia. 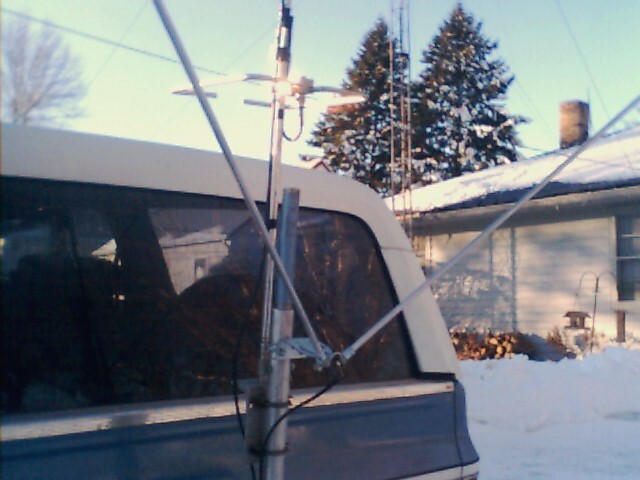 and headed out Sunday morning and headed to EN23 and worked NØSPP on several bands as well as KCØAKU in EN33,KA9FAJ in EN40 and then on over to the grid lines of EN12,13,22,23 and worked several contacts there. Interesting spot there cause there is a gravel road that travels northeast and within a couple hundred yards or so you go from EN12, to 22 to 23 and then just 1/4 mile north and a bit west you are in EN13. The only problem is it is not very high elevation but still managed to work several including WBØULX on 6,2,432. I might mention that at this point I had worked Mike KMØT from every grid and on every band 6,2,223,5,432,1296 with the exception of 223.5 from EN32 and had worked Ray WBØHHM on 6,2,223.5 from most of the grids.From there I traveled north into Minnesota and EN14 I worked NØLL EM09 on 2 and KA0ØZEE in EN05( Randy is almost always around during the contests when I get up in that neck of the woods). From there I entered EN24 and then over into South Dakota and up to EN15. While in EN14 I heard NØVSB in DM79 Colorado and later he reported that he was hearing me but we could not get thru the stuff on .200. By this time as usual I was finding out that I was spending less and less time on my chosen freq of 144.160 and up on .200 with the multitudes and there are many qso's that could have been completed otherwise but u always go where the action is you know! I was a little dissapointed when I was in Minnesota that more stations in EN34,35 did not look west. I was going to travel to EN04 and 05 but due to the level of activity in the area I decided to head over into EN25 and then south toward home as it was 0213. Before I left EN15 I worked VE4GLS in EN19. AT this time I was in EN14 and heading into EN24 and was trying to decide if I wanted to go back north into EN25 to activate a new grid for me or not, well I did and it grabbed me another 20 qso's or so and taught me that the little extra effort might be worth it. Well about this time the contest ended and I had about a 4 hour drive to get home,man all of a sudden I felt tired. Strange how u can get pumped up for a contest and then with the tick of the clock u are exhausted. Had a good time working all of you and one of my most interesting contacts was in EN14 when I workd NØUK, Chris. I only had 222 FM and he did not have the mode soooo he suggested that we use the microphone key and send the info for the contact that way. Needless to say we completed and I sure would not want to make many contacts that way but it worked! I did end up working Mike KMØT in every grid on every band except 223.5 FM from EN32 so almost a clean sweep! For this contest I used the stacked loops on 2 meters with 160 watts and stacked loops on 432 and 100 watts and a single loop on 223 fm @ 20 watts and 35 el yagi and 10 watts on 1296 and finally a home brew " v " dipole on 6 meters with 100 watts. 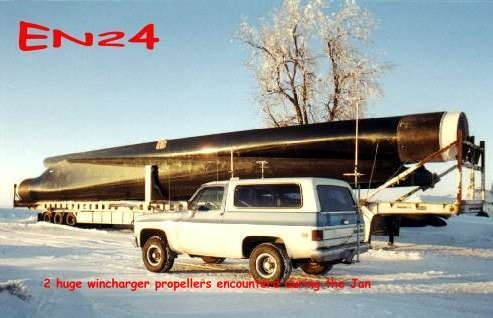 The vehicle I use for the rover is an older full size Chevy Blazer with a 6.2 liter Diesel and 200 plus thousand miles. Good milage and no ignition noise. It is equipped with a 70 am alternator(with only one belt,which u have to keep the belt reeeeal tight and carry a spare) and 2 large interstate batteries with lots of cranking power. The Diesel takes just a little current to run it( 12volts to turn the injector pump on) and now with the addition of an electric fuel pump a little more current requirement. The rig has glow plugs and a large starter and requires everybit of the equipment to start it ( glow plugs takea lot of current). I never shut the rover off when I operate and at idle it has very little effect on the fuel economy and has a huge radiator so it runs cool. I plan on being out for the June contest with more bands, possibly 902,2304 and ??? Will see how it all works out. Mike KMØT in EN13 has been a big help in my rover effort, he loaned me his Kenwood 642 with 220 and 1296 fm (Mike knew that the drive for more bands would bite me if he did this,sneaky) and I used them last year in September and did count for a lot of qso's. I have since sold the Icom 1271 and added Yeasu FT-736 with 222 and 1296 modules and a brick for 222 so this should improve the effort. I will hopefully see all of you in June! 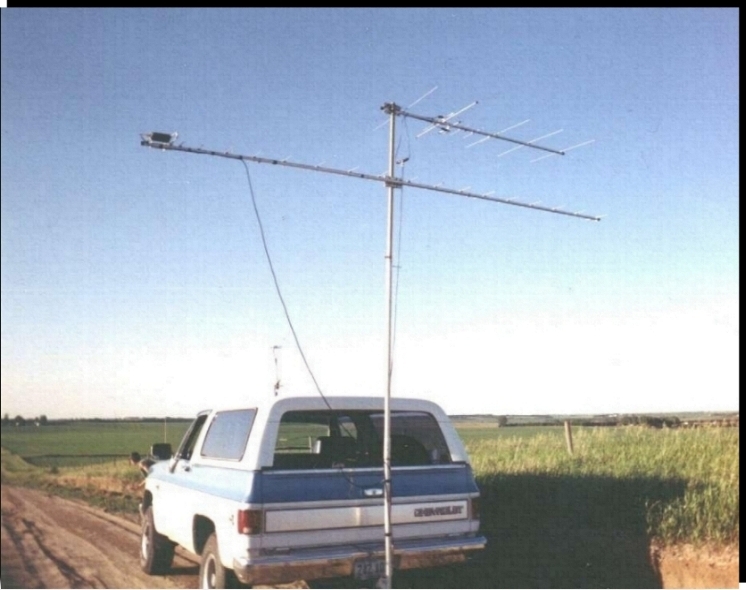 June 2000 VHF in EN01 in the edge of the Sand Hills In Nebraska with 19 elements on 432 and 5 elements on 2. 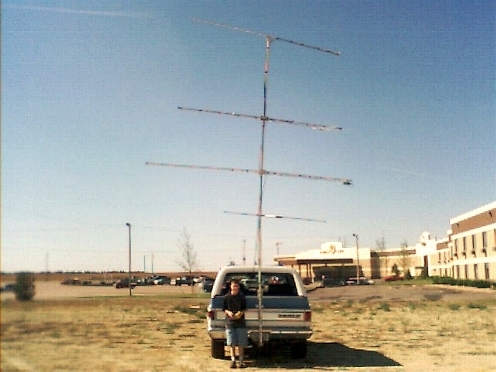 Here is a picture of the rovermobile and my son Josh at the DN92/93 grid line in South Dakota(Rosebud Casino in the background) during the September 2000 contest. The ant's are35 elements on 1296,10 elements on 2, 19 elements on 432 , dipole on 6 meters, HO loop on 222 and stacked HO loops on 432 and 2 meters. 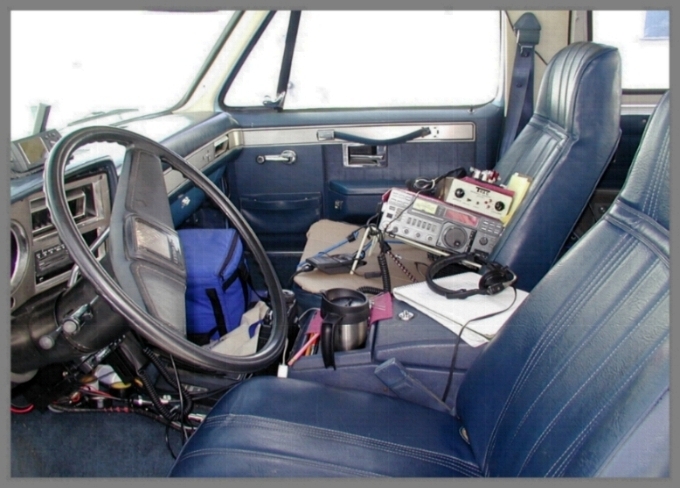 2 Windcharger Propellers in EN24 January 2001 VHF contest.